PELCO SynapTek grids have been developed to give perfect stability for coating with a support film. These TEM grids are extremely sturdy, easy to clean, contamination free and reusable after cleaning. With a thickness of 100µm (4 mil) (except Mo, which has a thickness of 75µm (3 mil)) and a diameter of 3.05mm, PELCO Synaptek grids are available with a standard oval 1x2mm slot. For higher yields, there are also versions available with a 0.5x2mm slot, a 0.8x1.8mm slot and a 1.5mm diameter hole. The standard material for the Synaptek grids is a beryllium copper alloy, however for special applications Nickel, Molybdenum or gilded (gold plated) versions are also available. The PELCO Synaptek TEM grids have special identification and handling features with some features combined. Supplied in vial/100, except molybdenum which is supplied in a vial/25. NUM: A number between 0-99 stamped on one side of the grids (instead of the dots) for identification. Numbers are in random orders and may be duplicated. NOTCH: An indentation stamped on one side of the grid to enable easy handling by tweezers. Inset: fully loaded PELCO SynapTek GridStick with 1 x 2mm PELCO Synaptek Grids. An inexpensive device to reduce or eliminate precipitate and dirt from your electron microscopy grids during staining. The PELCO SynapTek GridStick is manufactured from a thin but rigid alloy that does not react with commonly used organic solvents and stains. The stick is 4mm wide by 75mm long and has a slot along its center with small undercut notches on one side to make grid removal simple. A small area on top of each stick is reserved for identification (use a fine point permanent ink pen). The PELCO SynapTek GridStick is coated with a specially formulated pressure-sensitive adhesive. This adhesive holds the grids in place during staining, emulsion coating, carbon coating, shadow casting and serial section collection. The PELCO SynapTek GridStick will fit into conventional Pasteur pipettes. The grids lie in the same plane as the solution flow, minimizing chances of breaking Formvar films and collecting surface debris. The PELCO SynapTek GridStick was developed in conjunction with PELCO SynapTek Grids. Other grids may be used provided they have sufficient thickness to avoid bending when being removed from the adhesive on the PELCO SynapTek GridStick. PELCO SynapTek Grids are 100µm thick. 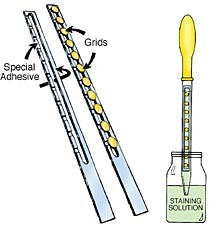 5 coated GridSticks, 10 Staining Pipettes, 2 flow-limiting Plugs and Bulbs plus Instructions. Note: Staining Pipettes are fire polished, heat annealed, acid cleaned, blow dried with filtered compressed air and capped. For adhering grids to the GridStick, includes instructions and coats about 200 GridSticks.